I started my studies in flute when I was ten years old and went on after high school to major in music at the Crane School of Music at SUNY Potsdam, New York. I didn't finish my college years there, though. I left Crane and college life after my first year and it was not until I was almost 40 years old that I finished my Bachelor of Music degree at Queens College in Charlotte, NC. On the way to finishing that degree I became interested in biology and went on after my music degree to complete a master's degree in biology at the University of North Carolina at Charlotte. I taught college biology for a short while and then moved to Asheville, North Carolina. In Asheville, I tried to take a different approach to flute playing. I was tired of the music world and the competitive, petty spirit which pervaded it, especially among flutists. I decided I would play my flute again, but only if I really, truly enjoyed it. I started looking for places where I could play for free. I played at church services, in the community band, for musicals, and didn't worry so much about whether I was "the best," or whether I was paid, but instead concentrated on enjoying it and letting others enjoy my playing. Little by little my playing skills returned and I began to wonder, what would happen if I actually practiced a little bit? (Instead of sight reading everything!) I had made the mistake in previous years of "forcing" myself to practice for hours on end and it had instilled in me the idea that practicing was distasteful. I heard of a teacher at Western Carolina University, Dr. Eldred Spell, who is Professor of Flute and taught flute repair. After attending a masterclass of his, I decided to enroll in the Master's program at WCU. Little did I know what this would lead to! Under Dr. Spell's teaching and encouragement I improved my flute playing and performance demeanor and I studied flute repair with him for two years. He is a marvellously patient, kind, and generous teacher. I started working as a flute tech while I was still at WCU and that is how Flutestar, my home-based flute and piccolo repair business, began. My repair work on flutes and piccolos must stand up to my own rigorous standards (the ones imposed on me by Dr. Spell!) and since I'm a flutist myself, I'm not happy until the flutes I work on respond to a light touch with full breath support. In early 2019 I moved permanently to Massachusetts, where I am excited to have a new shop in the old Lamson buildings in Shelburne Falls! An amazing renovation has taken place there and there are many small, interesting workshops: artists, poets, custom bike frame maker, a wonderful eclectic bunch that I join starting April 1. 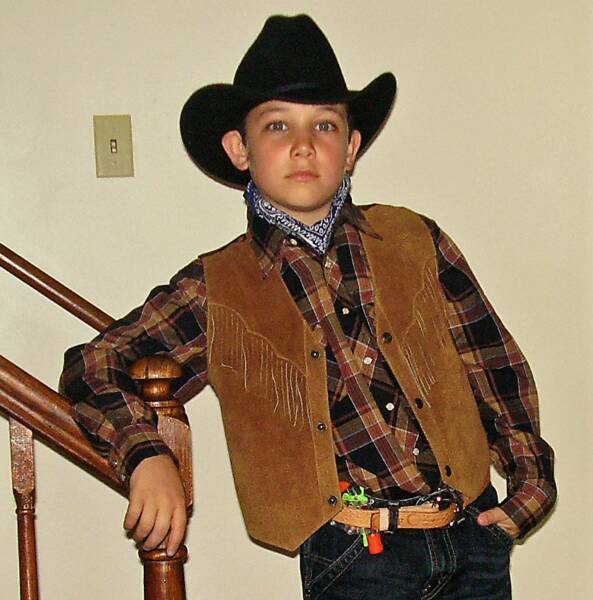 Why I wish I was a cowgirl... my grandson Darion, age 12. Hard to believe this isn't a postcard! Another photo I took on my trip to Ireland in June 2008. Since you've bothered to read all the way down to here,I've included this photo of me repairing flutes "on the spot" at the Florida Flute Fair, Orlando, January 2011. Cute, but Nerdy. Or is that, Nerdy, but Cute? You decide.